Sumptuous Food That Tastes Good...tounges tell all! 15th august; India celebrates Independence Day today. In Goa, We also celebrate the oldest feast day of Our Lady with great religious fervor the Feast of Assumption of Our Lady(Virgin Mary) on 15thAugust with rest of the world. The Assumption ( Latin: assūmptiō, "taken up") of the Blessed Virgin Mary into Heaven,informally known as “The Assumption” marks the bodily taking up of the Virgin Mary into Heaven at the end of her earthly life. As Mary completed her life as a shining example to the human race,the perspective of the gift of assumption is offered to the whole human race. The feast turns our eyes in that direction, where we will follow when our earthly life is over. 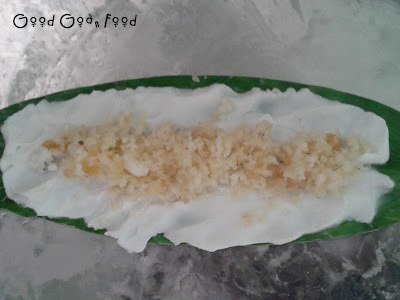 Goan’s prepare special sweet on this feast called patoleos made of a paste of ground local rice spread over turmeric leaves and stuffed with a mixture of scraped coconut, cardamom powder and coconut jaggery. 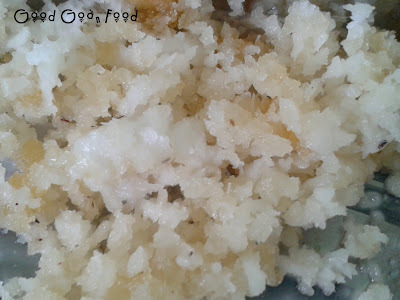 In Hindu homes coconut jaggery is substituted with sugarcane jaggery. Steamed or fried either way it comes out yummy. Patoleos is prepared in Hindu homes for festivals like Nag panchami,Mangal Gauri - Hartalika vrata(upvaas) , the eve of Ganesh Chaturthi . 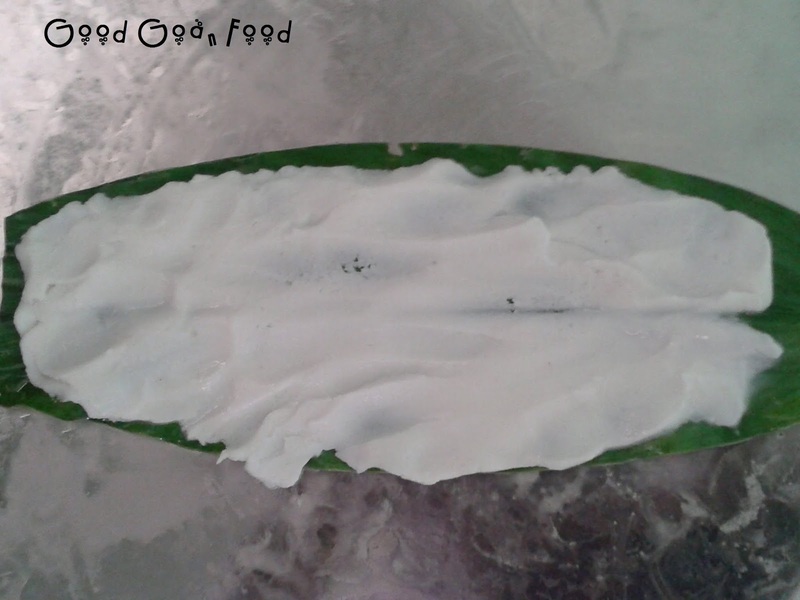 Salt free patoleos made of varai or wheat flour, are offered as naivedya to Goddess Parvati, as far as legends go Maa Parvati had a strong craving for these sweets during pregnancy etc and Catholic homes for festivals like konsache fest -harvest festival, San jao ( feast of St John the Baptist) and the Feast of Assumption of Our Lady etc.All the festivals / Feasts celebrated by both Hindu and Roman Catholic Communities associated with making of patoleos are celebrated during monsoon season June-September. 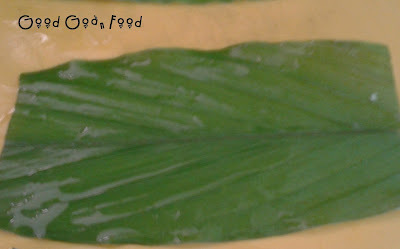 The key ingredient in making patoleos "turmeric leaves" have a very pleasant, unique aromatic smell rich in flavour.Turmeric leaves are used as a herb in cooking, as it gives a distinctive flavor to food. You can add quite a lot of these exotic tender greens to the any recipe, increasing your nutrient intake and giving your taste buds a real treat at the same time and it is medicinally useful as well, to prevent coughs ,colds,aches and pains. 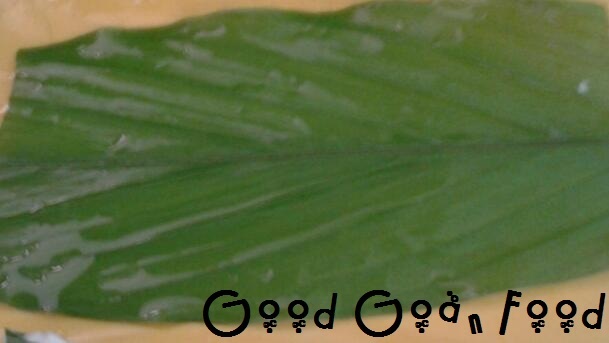 Turmeric leaves is cathartic, astringent and, antiseptic. It is also popular as a gentle laxative. Fresh turmeric leaves are widely used in India, mainly along the coastal regions, where almost every backyard will have a patch of turmeric growing in it. 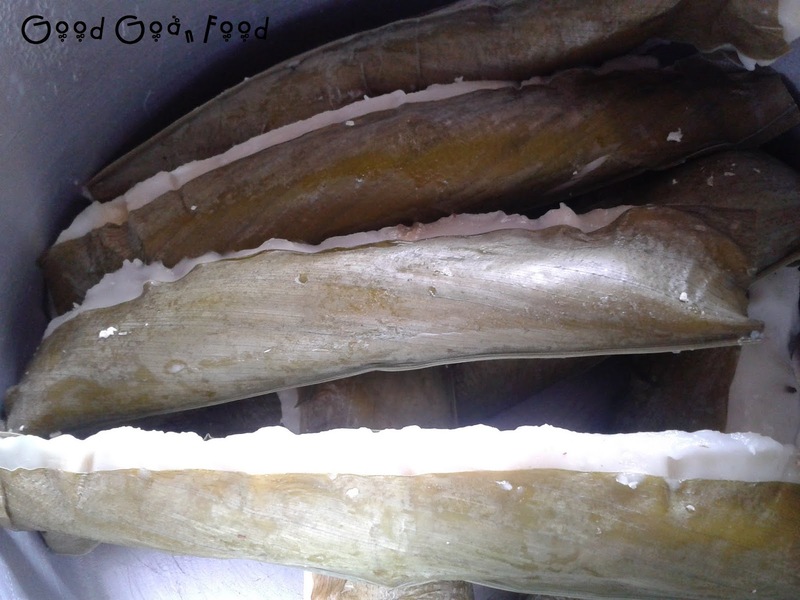 It's availability in our home backyard and market also coincides with the rainy season when patoleos are made .. Making patoleos a much savored and mouth-watering monsoon delicacy. 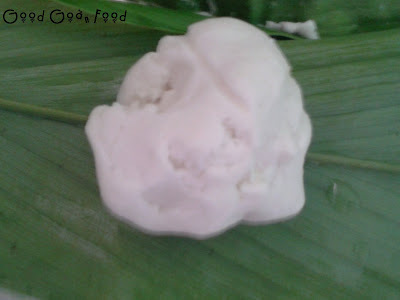 In a vessel add rice flour and salt for taste add enough water and knead the rice flour into a smooth dough.It should be easy to spread on the turmeric leaves. Wash and trim the turmeric leaves as shown in the pic,retain all the trimmings (dette-Stalks). Scrape coconuts fine,add jaggery,cardamom powder and mix well. Place a small portion of the dough along the main vein of the leaf . & flatten the dough towards the sides pressing with your fingers. 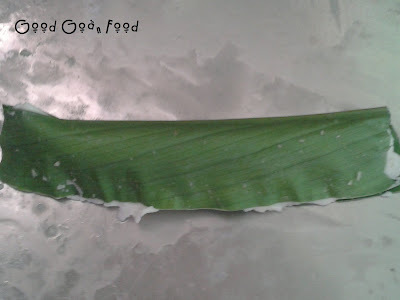 See that you spread the dough thinly and evenly on the leaf. 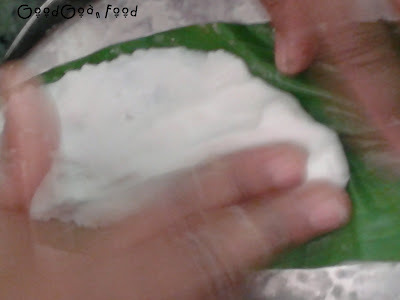 Then place a little of the coconut mixture in the center and fold the leaf over pressing the edges firmly. Add the trimmings(turmeric leaves stalks)along with the water added to the steamer(Confro). The turmeric trimmings will give out its sweet aromatic flavor in water; patoleos steamed in this flavored water will come-out more aromatic and yummier. 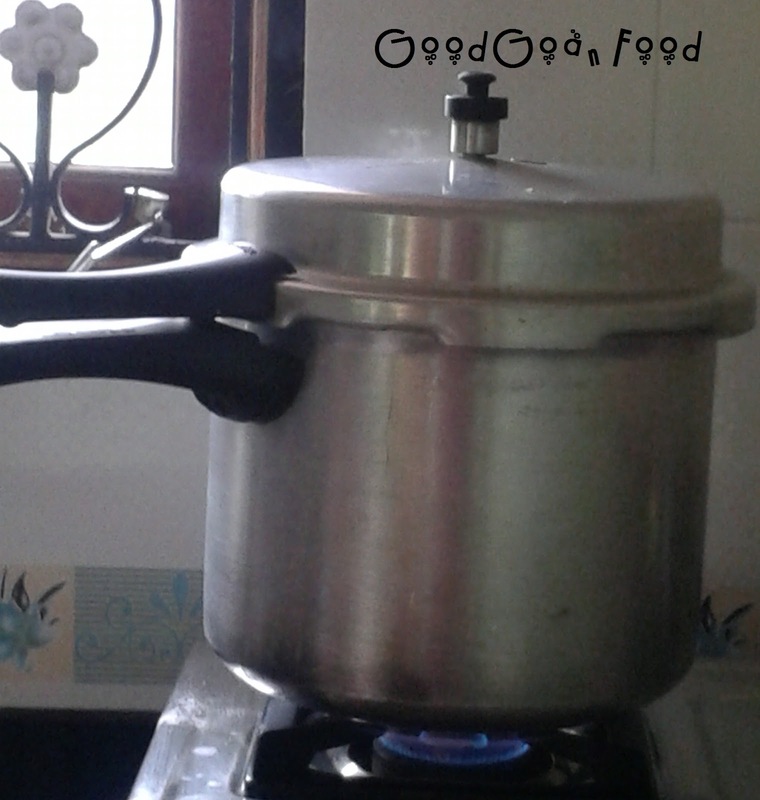 Steam cook the patoleos for15-20 mins in a confro or any modern steamer,or pressure cooker till done. Once done the color of leaves will turn olive/ shevaali (bottle-green)color.Serve hot with leaves on. Alternatively Patoleos can be fried on a skillet /Iron hot plate/ Tawa using Ghee/Oil...Hmmm equally yummy. *Confro- Traditional steamer in Goa. 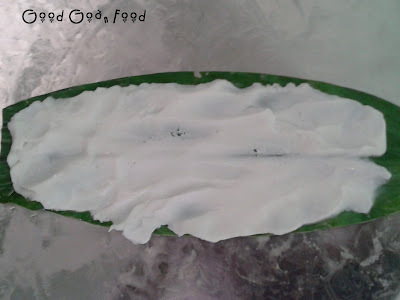 *The rice flour can be replaced by local red ( Ukade rice )available in Goa which can be soaked, dried and powdered. *Varai (Proso millet-)Varai is a kind of millet which is very fine and of small particles, almost like a coarser semolina.It is consumed by people who are on a fast. 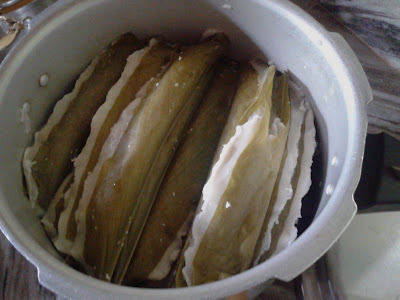 Hello I am Maria Arlene from the Philippines and I want to try the recipe you have described. 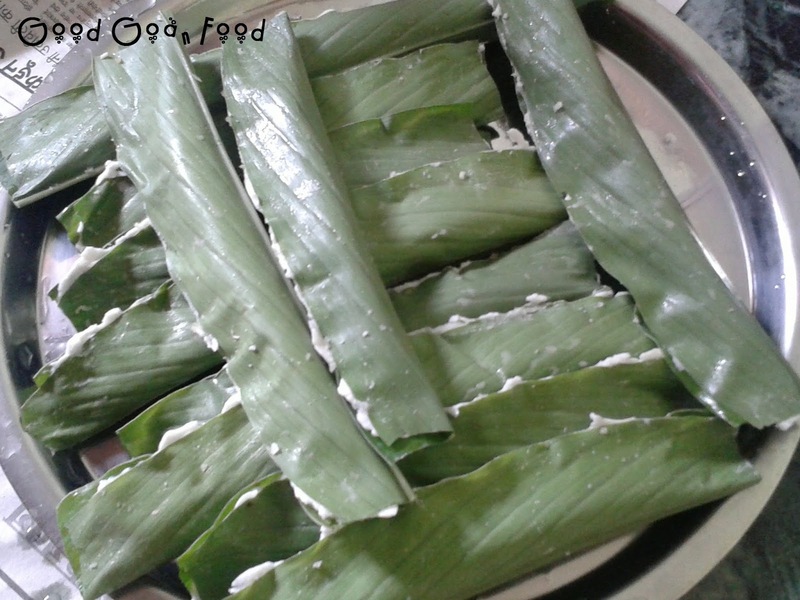 Kamonasish Mazumdar Aayush, your Bengali-is-great comment interests nobody in a recipe blog. Please read the article first before commenting. Complements to Chetana kochrekar Shetye for a sincere effort to reach to the masses who are enthusiastic in cooking Goan dishes. Well done for projecting your nice skill. Please respond to my comment as I may try your preparations if you give your contact number for ordering some Goan dishes of Raus fish. - Narendra from Ponda Goa. Let your taste buds travel the globe with foods from this side of the globe to the other side. With a journey that began by understanding your ingredients to cooking them up with sizzling recipes, we have created an exciting array of delicious recipes indigenous to worldwide cultures. These Local Goan, Indian and internationally inspired dishes were created with a flavorful foundation of the finest organic ingredients. Each recipe translates into premium flavors that emerge individually, yet always in harmony. Enjoy this world of tastes today, and please check back soon for more recipes, tips, and organic tools to add to your culinary globetrotting. Hi Friends, Welcome to my Blog, I belong to Goan Origin .An Event planner by Profession and a food enthusiast by passion. This blog will probably feature a combination of eating, experimenting, tried & tested recipes, how-to’s, research, food history and nutrition/health tips all relating back to food Gastronomy is still a much-to-be-discovered area ,So I encourage everyone to give it a try and let your tongue tell it all!! !